Could Snedeker Salvage The FedEx Cup? Snedeker, a 26-year-old Tennessee native and former Vanderbilt player, had the best round of the tournament. He finished at 22-under 266, earned $900,000 — and, perhaps most importantly, jumped 17 spots to No. 9 on the FedEx Cup points list. "Everything the tour has been telling us, you have a legitimate chance to win the FedEx Cup, (but) you've got to be inside the Top 15," Snedeker said. "That's why I came here — I wanted to get in the Top 15 and give myself a chance. ... I know my game can leave me tomorrow and I can have the shanks. I wanted to go as high as I could." With most of the elite players yawning at the $10 million annuity given to the FedEx Cup winner, it would seem that a less established player sneaking in to win may be the only hope for some genuine passion and emotion? 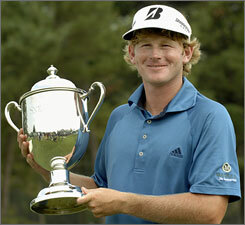 I for one would love to see someone like Snedeker make a run, since the annuity would actually mean something to him. Otherwise, if this is just an extension of the rich-get-richer pyramid scheme where underdogs have no chance to contend, then it'll probably fail.